Valerie Naranjo has gathered a force of West African and American master musicians to celebrate one of West Africa’s most fascinating instrumental traditions. Recorded on both American coasts and in Ghana, Lewaa’s Dream is a collection of ancient to contemporary compositions originally for the Ghanaian gyil. The individual selections of Lewaa’s Dream incorporate a diversity of instrumentations and styles, from the 10-movement “Guun” (Ancient Music For Solo Marimba) to duos and ensembles with traditional Ghanaian percussion instruments, concert piano, kanjira (Indian frame drum), Afro-pop style horns and trap set, and abstract dub hip hop drums and percussion. 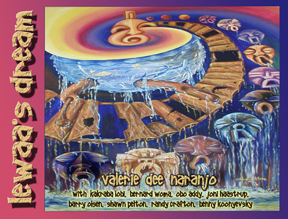 Valerie Dee Naranjo (percussionist, vocalist, composer, clinician) known for her pioneering efforts in West African keyboard percussion music, is originally from Southern Colorado. She moved to New York City after completing studies in vocal and instrumental music education (U. of Oklahoma) and Percussion Performance (Ithaca College). In 1988 her playing of the gyil’s traditional repertoire in Ghana’s KOBINE FESTIVAL OF TRADITIONAL MUSIC led to the declaration of a chiefly decree in the Dagara nation that women be allowed to play the instrument for the first time. She plays percussion for NBC’s Saturday Night Live Band, and has recorded and performed with Broadway’s The Lion King, The Philip Glass Ensemble, David Byrne, The Paul Winter Consort, Tori Amos, Airto Moreira, and the international percussion ensemble, MEGADRUMS, which includes Milton Cardona, Zakir Hussein, and Glen Velez. On six continents she endorses Avedis Zildjian (Cymbals) Pearl/Adams (Latin and Concert Percussion) and Vic Firth products as a soloist and clinician. Recent film score recordings include “Final Fantasy – The Dream Within” and “Frida”. Her work and music have been written about in “Modern Drummer”, “Drum!”, “Rhythm”, “Percussive Notes”, and “World Percussion Rhythm”. She was named “World Music Percussionist of the Year 2005”, as winner of DRUM! Magazine Reader’s Poll in that category. She has recorded several CDs of traditional gyil music with Kakraba Lobi and Barry Olsen, and the CD Zie Mwea with Mr. Olsen and Bernard Woma. Her solo Native American CD “Orenda” is on the Ellipsis Arts Label, and her series of nine written transcriptions and CDs, “West African Music for the Marimba Soloist” and “Lewaa’s Dream (Ancient and Contemporary Music for West African Marimba)” are published by Mandara Music. Valerie has apprenticed with some of America’s and West Africa’s strictest master percussionists, including Leigh Howard Stevens, Gordon Stout, Dave Samuels, Godwin Agbelli, and Adama Drame, and continues to spend summers in Ghana to further her gyil study with maestros Kakraba Lobi and Kofi Misiso. She has also researched and studied in Botswana, Burkina Faso, Egypt, Morrocco, Zambia, Zimbabwe, and South Africa, where, in 1994 with Thuli Dumakude, she opened Johannesburg’s Civic Theatre to its first post-apartheid audiences in the production BUYA AFRICA. Kakraba Lobi (composer/gyil) is one of the only living virtuosi to have gained international acclaim as a gyil concert soloist. He was born in Kalba Saru in upper-west Ghana into a family of gyil players. From 1962 until 1987 Kakraba was a full-time member, and is presently an advising member of the staff at the Institute of African Studies, the University of Ghana. His particular approach to composing and improvising has been studied by percussionists and ethnomusicologists from around the world. (Please see the recordings section for more info). Bernard Woma is the ceremonial Atumpan player and solo gyil player and drummer for the Ghana Dance Ensemble, with whom he has travelled internationally. He was born in Hineteng in the upper-west of Ghana, and spent his early childhood training in the house of renouned gyil player Xiem Tibo. He was named “best gyil player in the 1997 Kakube Traditional Festival in Nandom, Ghana, and has taught in Universities in the US, Europe, and West Africa, Bernard has performed in International Festivals throughout the world. Obo Addy (composer, singer, and percussionist) is the eldest brother in the famed Addy family of master drummers of Ghana. Since moving to the U.S. Obo has recorded ten CDs of traditional and original music, has written for the Kronos Quartet and other chamber ensembles, and has kept a non-stop schedule of concerts and workshops, at places including the WOMAD Festival and the Kennedy Center. Obo is the recipient of two Masters Fellowships, the Oregon Governor’s Award for the Arts, and the coveted National Endowment for the Arts’ National Heritage Fellowship. Joni Haastrup (singer, dancer, African drummer and percussionist) was “Soul Brother Number One”, one of his Native Nigeria’s stars of Soul music that conquered West Africa in the 1960s. He then lived in London, where he performed with Ginger Baker, and arrived in the United States in 1975 at the invitation of Capitol Records in Hollywood and EMI Nigeria. Joni has performed locally and internationally and recorded with a number of America’s best, including Taj Mahal, Chris Isaac, Hugh Masekela and Steve Smith from ‘Journey’. Barry Olsen (multi-instrumentalist) is a native New Yorker and alumnus of the Manhattan School of Music, who began his career in the late 70s playing trombone in New York’s Latin dance music scene. Over the years has recorded and performed all over the world with most of the major artists in this field, including Ray Barretto, Eddie Palmieri, Hector Lavoe, Tito Puente, Celia Cruz, Marc Anthony, and La India. He has also performed on trombone, piano, and percussion with Paul Simon, David Byrne, The Paul Winter Consort, Charlie Persip and many others. He first recorded in South Africa on the CD “Ancestral Healing” by South African artist Pops Mohammed, and the CD “Jazzin’ Universally”, with Airto Moreira, Jose Neto, Valerie Naranjo, and many outstanding musicians from that country. Since then he has performed with the jazz group Ingoma, led by South African saxophonist and composer Zim Ngqawana, having toured with them in Europe and the U.S., as well as in their home country. Barry is the pianist for the Latin-Jazz group Syotos, led by trombonist Chris Washburne, and is featured on their recordings “Nuyorican Nights.,” “The Other Side” and “Paradise in Trouble”. On marimba and percussion he is frequently heard in the orchestra of the Broadway hit “The Lion King.” He is completing a piano trio CD with Drummer Vince Cherico and bassist Boris Kozlov. Since 1988 he has been performing Lobi and Dagara music from northern Ghana, playing the drums known as kuar and gangaa, which accompany the gyil. Since performing in Ghana in 1996, he has recorded these instruments on the CD “Zie Mwea (Natural Conditions)” with Bernard Woma, several CDs with Kakraba Lobi, and Valerie Naranjo’s recording “Lewaa’s Dream. Shawn Pelton is one of the busiest drummers in New York City, having recorded with such artists as Bob Dylan, Carly Simon, Chris Botti, Roseann Cash, Bruch Stringsteen, Ray Charles, Van Morrison, Sheryl Crow, Bon Jovi, Elton John, Billy Joel, Hall & Oats, Shawn Colvin, The Brecker Brothers, Rod Stewart, and Buddy Guy. When he isn’t under headphones, he can bee seen on Saturday Night Live, where he is currently in his 14th season with the SNL house band. Randy Crafton has produced, performed, engineered, and composed, on the Ellipsis Arts, Lyrichord Discs, Narada, Hearts of Space, Interworld Music, Soul Purpose, Acoustic America, Earwig Music, Newport Classics, and CMP labels, and include CD’s by Ray Barretto, Ron Carter, Richie Havens, Dayna Kurtz, and Valerie Naranjo with Kakraba Lobi. As a percussionist/drummer, he has performed and recorded with The Albany Symphony Orchestra, Glen Velez, Omar Faruk Tekbilek, Richie Havens, Dayna Kurtz, The Lion King, and Riverdance (Broadway), and others. Benny Koonyevsky is a recipient of the Francoise Shapira Prize, through which he made his solo debut with the Israel Philharmonic. He was a member of the Israel Philharmonic under Zubin Mehta and Principal Timpanist with The International Symphony Orchestra, and is currently Assistant Timpanist with the Springfield (MA) Symphony Orchestra. He has toured with such artists as Omar Faruk Tekbilek, Ishtar the voice of Alabina, Sergio Salvatore, The Lion King and Dessa Rose (Broadway), and Peter, Paul & Mary; and recorded with Gloria Estefan, Vanessa Williams, Donald Fagan, and others. Available through online and regular retailers.